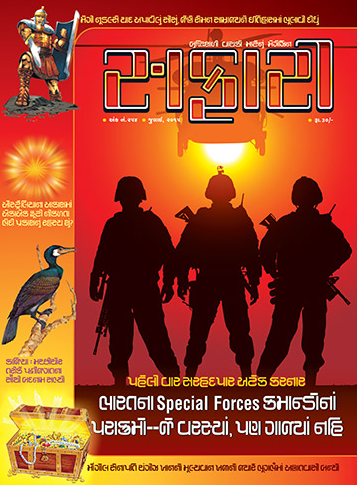 The July 2015 issue of Safari, a knowledge and science magazine from India, Gujarati Edition, hit the market on time. Here are our Views and reviews for the same. Though each of the issues of the magazine are independent and complete in its own. This issue definitely reminds you of May 2015 issue of the same. There are many similarities, in terms of content and the design. Though it is worth to note that both of them are unique on their own. The reader’s reaction section is definitely worth to go for. Most of the magazines uses it as Testimonials. We have noted though that Safari doesn’t filter it out to publish positive reviews only. A lot of readers have supported the initiative Safari have shown (or rather raised a question) that some people are wrongly declared as the patriots (Shaheed). The editorial talks about the improper ingredients used in the (mostly packaged) food and beverages. And it is not limited to Maggi Noodles, which is in talks now due to the ban on the same. The editorial is written in a broad aspect and its aim is to bring awareness in the people about harmful stuffs we eat or drink (knowingly or unknowingly). You must read this small section of the magazine. Another good thing we found is a very small article (on the inside of the front cover) about Angkor Wat temple. There is a small yet impressive photo of this monument in this article, which is quite different than some of the viral photos of Angkor Wat. The article also takes note of the Viraat Ramayan Mandir, a temple to be created in Bihar, India, which is aimed to be a replica of Angkor Vat temple. The size of this new temple would be double then the original! The editor dare to write that this is not a good decision and it will affect tourism in Combodia. Sometimes you need courage to talk about what you feel is true. The cover page uses cheerful colors in the background and test. The shadows of the commandoes with hovering helicopter and rising sun in the background, makes it really attractive. The themed article is about the Commando missions by Special forces of India. Though, most people have talked a lot about the recent commando mission by India at the border areas of Myanmar; this article is not talking much about the same. However the article talks about the history of various commando missions and history of such war tactics since the time of Chhatrapati Shivaji. It also explores how Major Megh Sinh and Lt. Gen. Gurbaksh Singh played very important roles in introducing the commando battalions in Indian Armed forces. The writing team is very mature and it doesn’t reveal any detail about any mission which is critical. Because, the “surprise attack” is the main weapon during such operations. We know, how the live coverage of 26/11 operation, turned harmful to Indian armed forces (and citizens, of course). This wiseness is writing must be appreciated. Those who are interested in history and likes to explore it, the very detailed article about Genghis Khan. Mostly known as a brutal ruler, he is considered as one of the most successful warlords. He earned more wealth and earth than any other ruler, under his rule. The mystery about the gigantic fortune he earned and how it was dug along with his body, is famous around the world. A lot of people have tried for years to find that hidden treasure so far, unsuccessfully. The article focuses the events from his grand father’s time and even shows the photographs of some typical residents of Mongolia (known as Ger). A well researched article. The Roman empire is considered as one of the strongest in the history right? What cause the fall of the same? Of course, the political events and internal disputes and fight to earn throne and wealth, are some of the main reasons. But do you know the excessive usage of Lead was also a reason, and probably more important than the others!! Well, a well researched article proves the point. The article also explores the excessive usage of preservatives in packaged drinks and food. And, how it is harmful to the people. And the sources of the same include food, water, polluted air and much more!!! It once again proves that anything which is fresh cooked and served instantly is the best thing for human body. The article is written in a big canvas and every citizen (from children to old aged people) should read it to raise awareness about the harm of adopting modern lifestyle. The travel lovers will like to explore the article about the Min Min Light. Various mysterious incidents associated to the same are explored in detail with some photographs and illustrations. The almost perfect looking answer of the mystery is also there in the article. Telling much about the same will affect your thrills during the read. When was the working sytem of 5 days a week started in various countries? Why we love to eat sweets? Why desert contains sweet only, and is taken after the main course? India have recently started preparing security papers on its own (it is used to print currency)? What will be benefits of the same? From which countries it was imported till now? Who climbed the mount Everest without using Oxygen tanks, for the first time? Shouldn’t they be considered as the first to conquer Everest? Explain the work system of Hybrid car. Why Wholemeal bread is considered as healthier option than the white bread? The actual shape of heart is not what is presented, then why it is used almost everywhere to refer the heart? Are ripe fruits better then the half-ripe? Why the current prime minister of India travel to so many countries? Is it a good decision? Does every planet have magnetic field? The magazine is definitely worth the money and time (spent to read and re-read the same). It is full of the knowledge oriented article. So definitely good to go for. Do let us know your views about this article via comments below, we like to read you. And yes, do not forget to share this article with your friends if you like it.